The offensive to liberate Raqqa is continuing at full speed. So far, we have dealt heavy blows to Daesh’ (ISIS) fascism and continue doing this. We are engaged in an intensive fight against Daesh gangs in what is the final battle in eradicating them. YPG and YPJ fighters have been at the forefront of the fight against Daesh’ fascism since the first day, gaining unimaginable victories and creating a revolution that has impacted the whole world. Foremostly Kurds, then the peoples of the region and after the Kobanê resistance, hundreds of young individuals from across the world, joined the struggle and revolution to make it a global phenomenon. Revolutionaries struggling for the freedom of humanity in their own countries have, since the Rojava revolution began, been flocking here to join a revolution they see as the hope of humanity. Joining the fight at the front lines, internationalist fighters who have been martyred, have gifted the Rojava revolution to all the world’s nations. 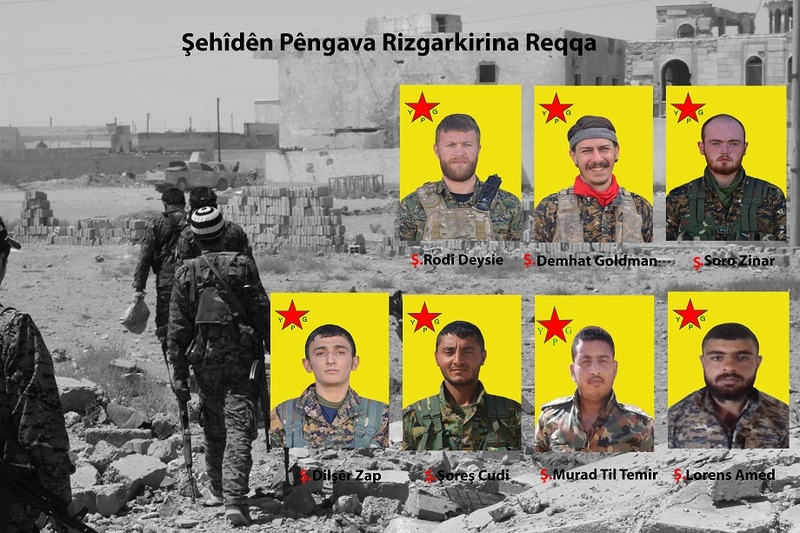 Six of the martyrs who were fighting Daesh’ fascism at the front in Raqqa, were internationalist volunteers. Comrades Demhat, Rodi and Soro, like all their other comrades, joined the fight to end Daesh’ barbarity and sacrificed themselves for a common and free life for all peoples. Another of our comrades, Dilşêr, was also martyred in an accident in Kobanê. As the YPG, we renew our vows to our comrades and promise that we will stay true to their memories and crown the revolution with victory. We also promise our internationalist martyrs that we will continue this revolution until all of humanity is free. Our people will also never forget and stay true to the martyrs who came here and who accepted Rojava as their homeland and its people as their own people and fought for them.